Air fryers are all the rage right now and it’s pretty easy to see why. They cook up food that’s nice and crispy, but it’s infinitely healthier than deep-frying or even pan frying. If you don’t already have one, our favorite model is definitely the Oster Dura Ceramic Air Fryer. Of course, if you’d rather start with something a bit less expensive, Amazon’s running a terrific sale right now that you should definitely take advantage of. 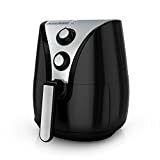 The BLACK+DECKER Purify 2-Liter Air Fryer is currently available at a hefty $67 discount, and it offers plenty of capacity as well as all the basic features you need. You should absolutely check it out while it’s on sale.